As CCP starts ramping up the publication of dev blogs in support of the launch of Eve Online's winter expansion Retribution, I came to the realization that I just don't care. Not about all the changes coming on 4 December, just expansions. I've played MMORPGs for over seven years now and I can only remember one expansion I was excited to see: EverQuest 2's The Shadow Odyssey. I was looking forward to the tradeskill instances where groups of players worked together doing carebear-type crafting work in addition to a lot of cool crafting and harvesting items. I was even able to get my own unicorn as a mount. But long time readers of the blog will know that problems with the launch of The Shadow Odyssey combined with issues concerning the shard system caused the implosion of my guild and I left EQ2 and made Eve my main game. I don't want to say that CCP shouldn't put out expansions. I like the different login screens every six months. But the changes never really affected me and the way I play. Retribution, with the changes to Crimewatch, will be different, but in a bad way. I think traveling around low-sec is about to get a lot more dangerous, which means carebears like me will stay in high-sec. The only reason I'm not going to go to high-sec at the expansion's launch is that I am not going to let CCP turn me back into a high-sec carebear without a fight. That's right, I am not in low-sec looking for PvP. I'm in low-sec engaged in some serious PvD (player vs. developer) action. The fact that CCP is enlisting the help of hundreds, if not thousands, of players in their effort to drive me back into high-sec just makes the war to remain a low-sec carebear tougher. So perhaps my lack of excitement about Retribution is a good thing. I only tend to move when I get my hopes up. Now I need to continue preparing for the upcoming war. The rankings of the top twelve MMORPGs as determined by the players of the Xfire community from play on Sunday, 28 October 2012. For more details about the methodology, click here. Historical data can be found here. The number of hours spent playing MMORPGs by the Xfire declined for the fourth consecutive week, declining Sunday by 4.8% compared to the previous Sunday. Of the games not in alpha or beta the biggest gainers were Metin 2 (+15%) and Guild Wars 2 (+8.3%). The games seeing the biggest drops percentage-wise were Need for Speed World (-24.6%), World of Warcraft (-13.1%) and Lord of the Rings Online (-10%). The Expansion Crash - This week saw a typical example of what currently happens after an expansion. For subscription games the big declines in player interest take place about 4 weeks after an expansion's launch as the first month ends and players begin to unsubscribe. World of Warcraft followed that pattern with the number of hours played declining by 13.1% as the Mists of Pandaria reached the 30-day mark. The Zombie Apocalypse - The zombie survival game The War Z is now available to play. Xfire considers the game an MMORPG so the game makes the list. The web site lists the game has having alpha support which makes the game the first alpha to make the Digital Dozen. Metin 2 - Metin 2 is a free-to-play that has hung around the middle of the Digital Dozen since I created the list back in February. This week saw the game reach the #4 position on the basis of a 20% bonus promotion when buying ZP, the cash shop currency. The promotion lasts until 7 November so the 11th, the first Sunday after the promotion ends, will show if the promotion leads to a lasting player gain. I don't have a big post on CCP's War On Bots™ today. Sometimes patience is a good thing in watching the world of botting and illicit RMT. With Team Security's crackdown now entering its eighth month, most of the tears have dried up from the botting forums but I'm finding some interesting open source information that I need to develop. Until then I have a few thoughts on what is currently happening in the run-up to Retribution. One thought is that the campaign to make botting socially unacceptable that CCP Stillman announced at Eve Vegas isn't coming too soon. Over the weekend I read on the Eve Pilot forums a thread in which a new botter had been caught for the first time but thought he could just alter his behavior and keep botting. The bot dev and long time users tried to warn the new botter that he needed to take additional measures to protect himself. I don't think the botter really believed the advice he received. I believe we are seeing a new wave of botters who have no fear of Team Security. Another item I'm noticing is that the price of illicit ISK is coming down. Since I'm not an expert in the illicit ISK selling sites I am using the sites listed on MMOBUX. Over the past two weeks the median price has fallen 1.8% from $22.41 per 1 billion isk down to $22.00. Why? I don't know. I do know that the number of sites listed has declined from 34-36 when I looked at illicit ISK prices back in May down to 29 sites this morning. In fact, two sites were unlisted overnight with one site, IGEVE, displaying a page stating that the website is down last night. Are the two things related? One thing I do know from following Chribba's new website Eve Live that spambots are advertising in Jita local even cheaper rates than those found on MMOBUX. My final thought extends past the Eve Gate and into the outside world. Is Team Security's effectiveness ultimately dependent on how other companies police botting and RMT? If new waves of players come into Eve from other games who believe that botting is acceptable will we ever be rid of our automated friends? Is John Smedley and SOE going to blow the implementation of Kronos and forget that the original idea of PLEX was to battle the illicit RMT trade? And is ArenaNet going to get its bot problem under control? Well, for now I just need to read Blagpuss' blog to know how the global war on bots is progressing on the Tyria front. Currently I'm playing two games, Eve Online and Guild Wars 2. I thought that by playing two games I could do the grind in one of them and then switch to the other and do interesting stuff. Well, that plan went out the window early because I just didn't realize what a grindfest Guild Wars 2 is. Eve players use the word "grind" to mean things they have to do in order to get the ISK they need to PvP. Those that don't like PvP use the word to refer to activities that increase standings with NPC corporations or factions. I'm currently grinding level 4 distribution missions with the Sisters of Eve in order to not only get the loyalty points but to get full use of Sisters of Eve station services like refining for free (or in the case of the market at a vastly reduced price). With current standings of 5.68, I think I can finish my grind this weekend and then do a week or so of exploration and bookmarking systems before going back to another standings grind. Guild Wars 2, on the other hand, is full of grind. Just a warning to all the crafters out there: gathering materials is a grind! The best advice for playing Guild Wars 2 is to not just play through the story and quest lines if you want to make gear that is useful as you level up. When I finished up Queensdale, the human starter area, I don't think I was level 15 in either of my crafting professions. I've spent my time the past couple of weeks gathering copper, cloth and leather in the attempt to level up. I think I'd rather mine in high-sec. Ugh! Hopefully once I hit level 25 in my crafting professions I'll have enough materials to make the unneeded items to level my crafting to the next level of items. On the plus side, since I've now hit level 20 because I get adventure experience for gathering and crafting I'm not worried about content being too difficult anymore. Of course, I am playing a ranger and I hear rangers are OP. I think the reason that I find the grind in Guild Wars 2 more irritating than the one in Eve Online are my goals. In Guild Wars 2 my goal is to reach max level in adventuring and in all the crafting lines. I don't really have to have any intermediate goals because the game will supply those. That means making a lot of items that I'm just going to salvage to reuse the materials so I can craft more useless items. Sure, at the end of the line I can craft legendary items, but is the payoff after months of effort worth it? In Eve, the goals I set are my own, so the grind is something I really impose on myself. Here are just some of the goals I've set over the past three years. Join Eve University and begin to get a clue how to play. Get perfect refining for Wandering Rose. Get capability to manufacture all my own ammunition. Manufacture my own tech 2 ships. Get blueprints to make meta items from COSMOS missions. Set up a home in low sec. The big difference is that a lot of the goals I set in my first six months of playing are still useful today. That ammunition I made for my Rupture is still useful when I fly a Hurricane. The ammunition I made for my Rifter is still usable when I fly my Jaguar. And I have so many extra blueprints from when I was doing invention that I can still make tech 2 ships if I decide to buy the materials off the market. By the way, have the prices gone down yet? In contrast to Eve, will the things I'm doing in this first tier of content in Guild Wars 2 prove useful further down the line except as a stepping stone to further content? Perhaps I'm wrong but I doubt it. Of course, I have to finish this stupid grind I'm on in order to find out. When Sansha Kuvakei decided to play in the constellation I was operating in last week, I decided to move to the nearest Sisters of Eve station with a level 4 distribution agent and start grinding standings. The standings themselves are nice but I was more interested in getting enough loyalty points to purchase the Sisters' scanning gear. If Poetic Stanzeil is correct and all carebears are deranged, then my condition is fairly harmless. I hate purchasing ammunition and scan probes fall in that category. I even ran the Wildfire level 4 epic mission arc to the get RSS Scan probes instead of buying them. So I started looking at the blueprints for the regular scan probes and decided that despite the fact that at 4.5 million ISK a copy for the blueprint originals making my own probes is not cost effective, I wanted to make my own regular probes to turn in for Sisters' probes. In my old high-sec days a few months ago, the materials list would have seemed daunting. Lots of low sec minerals on the list. But now that I'm living in low-sec, only two of the materials are a challenge: megacyte and strontium clathrates. Megacyte is a challenge because the proper gravimetric sites holding Spodumain don't pop up all that frequently. However, I have a bunch of megacyte sitting in a hanger because I didn't want to sell it because I might want to use it one day. I was thinking of building ships, but scan probes are useful also. The second material, strontium clathrates, isn't really challenging to get. All I have to do is mine ice. Have I mentioned I've never mined ice outside of a mission? And that ice in high sec only yields 1 unit of strontium clathrates per unit of ice? Ugh! But low sec holds two different types of ice that yields more. Glare crust yields 25 units of strontium clathrates and dark glitter yields 50 units per unit of ice refined. In case you are new to Eve, ice mining in low-sec is pretty dumb unless done as part of a large corp operation. One could say only a deranged person would mine ice in low-sec. Especially since only one system in Minmatar low-sec contains dark glitter. Yes, that ice is that rare to find. I might just skip the ice mining portion and buy straight off the market. Or maybe not. I think the insurance on my Procurer is about to expire. The only question I have now is: do I fit a prop mod or a web? I already know if I go ice mining I'm going to fit a point. The rankings of the top twelve MMORPGs as determined by the players of the Xfire community from play on Sunday, 21 October 2012. For more details about the methodology, click here. Historical data can be found here. Usually when 10 out of the top 12 MMORPGs played by the Xfire community see a rise in play the overall hours played rises. But the two games with a decline in play were Guild Wars 2 (-11.5%) and World of Warcraft (-9.1%), thus resulting in an overall decline of 4.8.% in hours played. The game seeing the biggest rise in interest Sunday was Lord of the Rings Online seeing an increase of 36.9%. Lord of the Rings Rides On - Last Monday saw the release of the Riders of Rohan expansion for Lord of the Rings Online, propelling the Turbine product up 2 spots on the Digital Dozen and netting an impressive 36.9% jump in hours played by the Xfire community. I'm not sure how much of the new content is available to the free players but I don't expect LotRO to drop too much over the coming weeks. Guild Wars 2 Is Not Dying Yet - Last week I asked if anyone had started asking if Guild Wars 2 was dying due to the double-digit declines in play every week. Tobold stepped up and argued that no, GW2 was not dying. I agree and have one reason Tobold didn't cite. To me, Guild Wars 2 is effectively an expansion, with most players moving from the original game to the sequel. Considered as an expansion, over 2 million unit sales over the first month puts it in the neighborhood of the Mists of Pandaria sales. Unlike EA/Bioware and Star Wars: The Old Republic that reportedly required 500,000 subscribers to break even, I would wager that GW2's box and download sales will more than cover ArenaNet's development costs. Guild Wars was not a failing game with a strong interest from the Xfire community in the six months leading up to the launch of GW2. Along with the strong sales if ArenaNet can hold onto more players willing to use the cash shop than played Guild Wars by the time the first expansion for GW2 is released, then the game will be a commercial success. "SOE is redefining itself as a creator of emergent gameplay experiences. That's our future." Apparently CCP's influence on game studios in San Diego goes beyond former Eve Online senior producer Nathan Richardsson becoming the executive producer for Trion World's new MMO Defiance. Sony Online Entertainment is starting to add elements to their games influenced by Eve Online. In an interview with The Mittani in September SOE President (and HBC member) John Smedley acknowledged that Eve had influenced parts of Planetside 2. But at this weekend's SOE Live event in Las Vegas SOE players got to see firsthand the upcoming plans for their games. At John Smedley's keynote address Friday night he made a couple of notable announcements that, if not attractive to Eve Online players would sound very familiar. The first was about a new way to pay for their premium subscriptions using in-game currency. SOE is moving all of their games to a hybrid model in which people can either play as a traditional free-to-play model or can pay a subscription. Up until June players in EverQuest 2 had developed a system in which players traded Station Cash for platinum, the highest denomination of in-game currency. But that came to an end when a $15 Station Cash card purchased at Wal-Mart was able to pay for an entire year's subscription. To replace what the players had tried to develop Smed announced the Kronos. The Kronos is an in-game item good for 30 days of game time that can be sold between characters. And while I haven't heard the presentation, I believe the word PLEX was mentioned to describe the Kronos. The concept of emergent game play also figured prominently into SOE's plans. I'm not sure how SOE will foster emergent game play, but if Smed had fun during the Burn Jita event (which is possible since he was a member of the CFC at the time) perhaps he will find a way. Or perhaps the SOE chief is thinking of player organizations like Eve University, of which he was a one-time member. Could his game developers plan on developing good corporation guild interfaces? Perhaps the biggest piece of news concerned EverQuest Next. "I have to be honest with you. We have completely blown up the design of EverQuest Next. For the last year and a half we have been working on something we are not ready to show. Why did we blow up the design? The design was evolutionary. It was EverQuest III. It was something that was slightly better that what had come before it. IT was slightly better. What we are building is something that we will be very proud to call EverQuest. It will be the largest sandbox style MMO ever designed. The same exciting content delivered in a new way. Something you’ve never seen before. The MMO world has never seen before. We didn’t want more Kill 10 Rats quests. We didn’t want more of the same. If you look at the MMOs out there, they’re delivering the same content over and over again. So are we. We need to change that. When we released EverQuest, we changed the world. We want to do that again with a different type of game. "The class-based free-to-play fantasy MMO is a collaboration with Runes of Magic developer Runewaker, and it boasts some curious features like extensive player housing and frontier systems. The site says the housing system allows for the construction of 'epic structures that defy imagination,' while the frontier mechanics grant guild leaders the power to build a kingdom complete with citizens and a powerful military." Player-built kingdoms on the frontier? That's not introducing null sec to a fantasy MMO is it? SOE is definitely setting itself up as an innovative company in the MMO space once again. Perhaps not as innovative as a company trying to merge a subscription PC spaceship game and a console F2P MMOFPS together into one virtual world, but CCP had a headstart in attempting crazy ideas no one thought would work. But at this stage of MMO development, following a bunch of space vikings may prove the road to success. Logistics. For me that means grinding standings with NPC corporations so I can have perfect refining at stations in the system I mine in. I really don't like jumping through gates with ore; refined minerals are so much smaller. If the station contains a factory, even better. I located a good station to set up as a second home in low sec and a great pair of agents handing out level 4 courier missions in another constellation. With the pair never giving me missions longer than two jumps the standings were rising swiftly. Then I logged in last night and found that Sansha Kuvakei decided to pay a visit. That's right, my system was the subject of an incursion. I expect the incursion to last a week. Unlike high sec incursions where the event is dragged out while the incursion runners farm the NPCs, I hear that no one bothers to dig Sansha out of low sec constellations. And why should they? No honest pilot lives in low sec because vast hordes of rampaging evil pirates jump on people the second they uncloak after jumping into a low sec system. Actually, for incursion fleets that last statement probably isn't very far from the truth. I've never run an incursion myself but I hear that the top fleets are called "shiny" fleets because of all the expensive fittings put on the ships. If word spreads of a shiny fleet in low sec, I expect pirates would soon find it. After all, pirates down through the ages have loved shiny objects like gold, diamonds and faction fit Machariels. So with Sansha paying a visit I'll have time to set up some more bookmarks around my second home. I've made sure I'm in a different constellation so that one incursion won't shut me totally down. Or maybe I'll take a trip and grind faction with the Sisters of EVE and at the same time get some nice scanning gear. Fortunately I haven't gotten to the point in Eve that an event in one system or constellation keeps me from having fun. People that know me know I'm horrible at Eve. I can fly around cloaky and generally avoid trouble, but I'm pretty bad at other things, like shooting other ships. If the ship isn't an Angel Cartel NPC, bet on the other guy. I'm a Minmatar pilot who can also fly ORE ships. Get me away from those and I'm pretty lost. That leads me to a problem. How am I supposed to gauge the effect of the upcoming nerf to heavy missiles on bots? I was able to look at how the mining ship changes would affect botters because I have pilots with good mining skills. But how do I judge the effect of the changes on the Tengu, a very popular ship with botters? From everything I've heard, botters like two attributes on their mission/ratting ships: range and a hefty shield tank. But I really don't have any way to judge on the test server because I have no Caldari ship skills at all. "The lack of TE bonuses also puts paid to the idea of greatly extended ranges on torpedo-fit battleships, which is probably one of the main reasons why the idea was scuttled for now. Pity too, because I was looking forward to a renaissance of extra-long-range torp Ravens and Typhoons. It might still happen, but it won't be soon. "These changes, though, pale next to the continued savaging of the Heavy Missile Launcher. While the damage nerf is being reduced somewhat, from 20% to 10%, the explosion radius is also being increased. That's mostly going to impact the HML's ability to damage the new destroyers and armor HAC gangs. Damage from an HML Drake to a Guardian will essentially be cut in half. It's a big nerf. The 25% range penalty also remains, adjusted slightly to impact missile flight time instead of velocity. Missile velocity is actually being buffed twice over which is going to somewhat help the HML's ability to actually deliver damage on target in a timely fashion. "But it won't much matter because fewer people will be fitting the things." Fewer people may use heavy missile launchers, but what about bots? Is the nerf going to reduce the DPS from Tengus enough to make then not as useful in running level 4 missions? The Tengu was tailor-made for botters since the training time for the ship is so much faster than for the Raven. And according to Ripard's analysis the Raven is not getting buffed via a tracking enhancement buff so that doesn't produce an incentive to just train for a torp Raven right off the bat. From what I can tell botters may need to go back to flying Ravens once Retribution launches in December. Combine the heavy missile changes with a crackdown on the illicit RMT activities of some null sec alliances and I may have some interesting forum reading ahead of me in the months to come. Of course, I could be completely wrong. So what do you think? I'd really like to know. After watching last night's U.S. presidential debate I am convinced more than ever that I should vote for Mittens. No, not the imposter Mittens: Mitt Romney. I'm referring to the original Mittens, Eve Online's favorite spy master/tyrant/media mogul The Mittani. Too bad The Mittani is not running because I think this year has shown that the U.S. currently has the worst political class in my 48 years of living on planet Earth. He'd win in a landslide. But enough about The Mittani. What has me riled up currently is the press. Not the gaming press who I've railed against before, but the real world mainstream media. Specifically the presidential debates. I watched the one last night and the moderator, CNN's Candy Crowly stepped on it. She decided to interject herself into the debate on the subject of Libya and then admitted she was wrong about her facts on CNN afterwards. Two paragraphs about U.S. politics is enough because I have not come to bury the U.S. political system; I have come to praise the Eve Online community. CCP has created a virtual world in New Eden and the players have imported their ideas of how the world should work. The most striking example is TEST's IT operation that has more stringent quality control checks and operating procedures than many real world companies. The U.S. presidential debates are showing this dedication to making New Eden a better world than meatspace extends to the internet radio and podcasting community. At the risk of slighting someone, I'd like to point out three examples of people I think have proven over the course of their Eve careers that they would do a better job of moderating a real life debate than what we've seen so far in the U.S. presidential and vice-presidential debates. The first is the long time Eve Radio veteran Funky Bacon. He helped lure me into Eve with the professionalism he displayed in his coverage of the Band of Brothers takedown which included handling both BoB's Dianabolic and The Mittani on his show at the same time. He further showed his capability towards impartiality when Massively.com's Brendan Drain appeared on his show with The Mittani. Do I think Funky Bacon would have done a better job of moderating a town-hall style debate than Candy Crowly? Hell yeah! He also would have done a better job than vice-presidential debate host Martha Raddatz and probably than Jim Lehrer. The second figure is current Eve Radio rock DJ and Voices from the Void host Arydanika. During the past CSM election cycle she hosted several two and three person debates and while she has a more light-hearted tone than Funky Bacon I think she would definitely have done a better job than Candy Crowly last night. Last but certainly not least is the master of the marathon podcast Jade. With two CSM election cycles under his belt, the Lost in Eve podcast sets the standard for CSM debates. Jade and his co-hosts do what I think real world journalists should do; get the facts from the candidates and then perform the analysis afterwards. Am I idealizing the jobs not only these three but the entire Eve podcasting and radio community do? Perhaps. But I still maintain the hobbyists who are learning on the job still do a better job than the trained professionals. I've made that argument about the mainstream gaming media in the past. Now I think we have proof that the Eve community does a better job than the mainstream media as well. The rankings of the top twelve MMORPGs as determined by the players of the Xfire community from play on Sunday, 14 October 2012. For more details about the methodology, click here. Historical data can be found here. Sunday saw the Xfire community spend 7.8% less time playing MMORPGs than the week before. Percentage-wise the big gainers for the week were Lord of the Rings Online (+13.1%) and APB:Reloaded (+10.6%) while the game seeing the biggest decline was Guild Wars 2 (-16.6%). 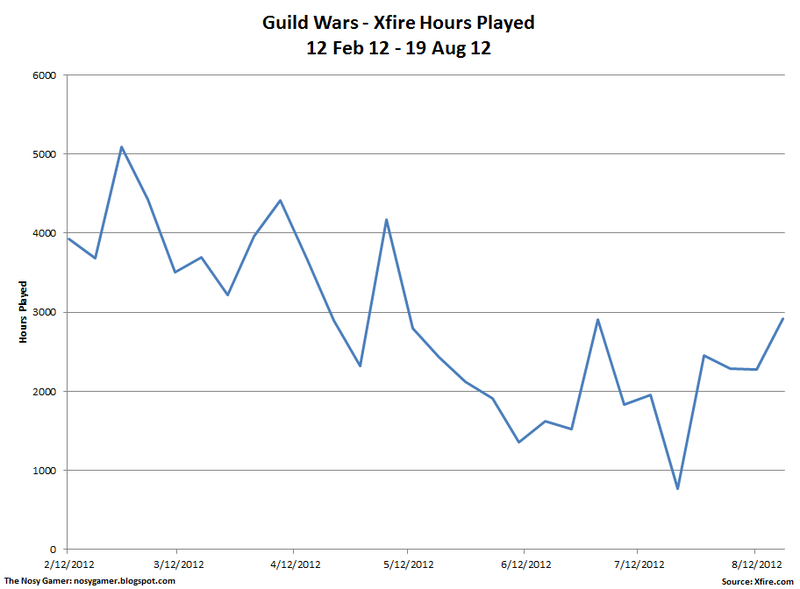 Falling Faster Than Felix - For the fifth week in a row the time the Xfire community has spent playing Guild Wars 2 has declined by more than 12.5%. Since 2 September the number of hours played has fallen by 68%. Has anyone started asking if GW2 is dying? I won't, but I am not willing to predict where the game will bottom out. Prelude To Free-To-Play - I keep wondering when Star Wars: The Old Republic will finally reach bottom. With Game Update 1.5 now on the public test server I think players will soon be able to at least begin playing for free soon. I had heard that would occur in November but I could not find a link to confirm the date. Despite its nearly year-long fall, SW:TOR is still the third ranked game and I wonder if the game will remain more popular than Aion, at least among Xfire members. At the end of February this year CCP Sreegs and Team Security launched an offensive against botters and those engaged in the illicit RMT trade. They even busted the illicit RMT operation of the creator of the Questor mission bot. At Eve Vegas on 6 October CCP Stillman announced the next phase of Team Security's anti-RMT strategy; making the practice of botting and ISK selling socially unacceptable amongst the player base. For those who have not yet seen or heard CCP Stillman's presentation, I have transcribed the section following the video of CCP blowing up the POSes of corporations caught engaging in the illicit RMT trade. "The point of this video is that the social acceptance of botting/RMT botting RMT is going to come to a stop. We said at Fanfest this year that we were going to eventually look into it and we feel that we are at a point where we've dealt with the low-hanging fruit we can do in terms of detection of botting. "The next big issue is really the alliance acceptance of this kind of bad behavior. So this was the first that we took a bunch of corporations we banned; we're going to wipe the POSes and everything they have. And what we are going to end up doing coming up is that we're going to make sure that if an alliance is hosting botting/RMT botting RMT they're not going to continue doing that. We're going to make sure that they feel the pain. But we don't want this going on. We don't want it to be an alliance (unintelligable). It's crazy what's going to happen. And we're not going to do anything drastic or anything, really, like an Unholy Rage against alliances. "We're going to adopt the same philosophy as we do with our botting/anti-botting work is that we are going to go for a slow burn. We're going to measure every step we take. We're going to see what impact it has. We're not going to kill the whole alliance overnight, like, 'Hey guys, bad luck,' at least not initially. We're going to make sure that everybody understands what's going on. Despite CCP Stillman's use of the term "botting/RMT", CCP Sreegs does not plan on holding alliances responsible for the activities of those who do not engage in ISK selling. I spent last week exchanging emails with CCP Sreegs asking questions about what Team Security intends to do as he was concerned that the coverage of Eve Vegas did not accurately portray his strategy. What resulted was a rather lengthy interview. 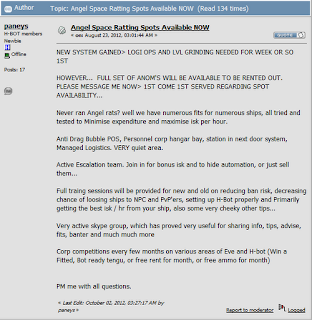 UPDATE 27 January 2013 - The phrase "botting/RMT" was transcribed incorrectly. The phase was "botting RMT" to distinguish botting that is sold for real-life cash vs. botting that is just done for in-game advantage. Most of the confusion surrounded the use of this phrase and people, including myself, not interpreting the phrase correctly. Massively.com released the news yesterday that former Eve Online Executive Producer Nathan Richardsson is now working on Trion World's new MMORPG Defiance. The man formerly known as CCP Oveur is not only the executive producer for the new game but also holds the title of Vice President of Development. I guess that completes the trade that brought David Reid to CCP. The man who adopted the name CCP Pokethulhu is currently CCP's chief marketing officer but at Trion served as senior vice president of marketing. Many may remember Mr. Reid as the man who created Rift's "you're not in Azeroth" campaign. Others may remember Mr. Reid's statement when he was at NC West that Tabula Rosa was "triple-A and here to stay" a month before the announcement that the game would close in February 2009. One place where Trion is getting the better end of the trade is in YouTube videos. So far we haven't seen any good entertainment videos from CCP Pokethulhu while CCP Oveur managed to appear in a couple of good ones. Besides his cameo appearance in the YouTube hit HTFU, he appeared in a couple of other memorable videos that I'm including below. Enjoy! I've felt a few emotions since I woke up on 12 September to the news that Sean "Vile Rat" Smith was among the four Americans murdered in the attack on the U.S. consulate in Benghazi on 9/11/12. Anger that it happened. Disbelief that I had a connection to one of the victims through Eve Online. But as the news came out about what really happened I had a sense of overwhelming disgust at our government who lied cover up politically inconvenient facts about its incompetence. That incompetence extended to they clumsy lies it put forward, which fueled my disgust even further. Do they really think the American people are THAT dumb? But last night for the first time I cried. Sean's mother was interviewed by Anderson Cooper on CNN. I didn't know Sean, but this video broke my heart. Update: There is a on-line fundraiser for Sean's family still open on You Caring. If you haven't given yet, please consider going over and contributing. "We don't have anything planned right now but what I'd like to do is I'd like to make a stock market that basically depends on how your alliance is doing. So there would be some formula that says that if you have X number of systems your stock would be worth that much. And I kind of want to do that so you'd be like, "I kind of think that alliance is going to do well in the future." And you can buy some stock and they take like five constellations and it basically goes up and you can sell it to someone else. And then of course hopefully someone will find a way to game the system. That they make some alliance and have people invest in it and then it would basically be a fake thing and everyone's going to be like really mad and send petitions and then I'm just going to sit there and be really happy." When I heard CCP Soundwave say this I immediately thought of Intrade. Intrade is a prediction market in which you can make (or lose) money by predicting events. I think of them like futures trading on commodities. You basically place a bet on whether an event will occur, but you can trade your bet to someone else if you want to cash out early before the deadline or event occurs. With Intrade, if you hold shares when the event occurs and it comes true, you receive $10 a share. If you hold the shares and the event did not occur, you get nothing. Of course, trading of shares is possible. Here is an example from the Intrade site. "You buy shares at a price of $6.00. The next day the price has increased to $7.50. You can sell these shares and take a profit of $1.50 per share. "You buy shares at a price of $6.00. The next day the price has dropped to $4.90. If you sell these shares you will suffer a loss of $1.10 per share. "(Why would you sell for a loss? You may want to sell your shares if you think the market will drop further, to help minimise your potential loss.)" I don't know how CCP would set up such a system in game. Perhaps automatically set up markets for the possibility of each side winning the isk war, plus the possibility of each side surrendering. Maybe make another automatic market for how long the war will last. I'm not sure how popular this feature would be considering the massive potential for fixing fights, but I'm sure lots of people who have too much isk in their wallets might start betting on wars. And if such a market became popular, then it could turn into an isk sink, because CONCORD would impose a transaction fee on each purchase, right? The rankings of the top twelve MMORPGs as determined by the players of the Xfire community from play on Sunday, 7 October 2012. For more details about the methodology, click here. Historical data can be found here. The Xfire community sent 10.2% less time playing MMORPGs on Sunday than the week before. The decline ran across the board with 11 of the 12 games seeing less playtime. The only game that defied the trend was Lord of the Rings Online which saw a 0.8% gain in time played. A technical glitch? I don't really have any proof to back this assertion up, but I think Xfire possibly had a glitch in its storing of data. While the dip in Guild Wars 2 follows a trend and the drop for SW:TOR could indicate player dissatisfaction with patch 1.4, I find it a little hard to believe an 11% drop so soon for Mists of Pandaria. Combine that with the fact that Eve Online experienced a 2.7% decline while seeing peak concurrent users rise by over 7% compared to the Sunday before and something may have happened. Another beta. In good news for Sony Online Entertainment Planetside 2 landed in the beta even though the game is still in closed beta. The game is still unpolished with areas still unfinished but players are anxious to play. For those interested in the game SOE President John Smedley is very active on Twitter responding to people. His Twitter account is @j_smedley. Sci-fi's gains. With Planetside 2's debut science fiction games now hold four of the spots on The Digital Dozen. PS2 may slip down again but its performance this early in the beta process indicates that the game will have a place on the list when it finally goes live. With four sci-fi games and two driving games, the list shows that MMOs today are about more than elves and dwarves. "We will continue to expand the scope of this to include asset seizure in the coming days which will include reclamation of supercaps and actions against alliances if need be." Eve Vegas was held this weekend and amongst the Eve developers speaking at the event was CCP Stillman. Those who thought the event would provide little news did not forsee the bombshell tacked onto the end of CCP Stillman's presentation. I missed large portions of that section of the talk but Sugar Kyle blogged from on-site and filled in the blanks. CCP will now hold alliances responsible for some botting that occurs in their space. According to the video which I didn't get to see, POS utilized by botters and illict RMTers belonging to alliances are subject to destruction. Q. What is the current policy with regard to ISK and assets on a proven botter's multiple accounts? Do you seize all their ISK, or some of it, or none? Do you asset strip them? CCP Sreegs: "Today, as in like right now, assets aren't touched but I don't see it staying that way." Q. If the decision is made to begin confiscating assets, will this include Supers and Titans bought with botting ISK? And how soon will this begin? CCP Sreegs: "I would say that however this is implemented the size of assets won't matter, but I can't speculate on time frames or even 100% guarantee it today. I'll just let you guys be pleasantly surprised if it happens." For observers of CCP's campaign against illicit RMT and botting, the question wasn't whether CCP Sreegs would begin "enlisting the help" of alliances, the question was when. CCP Stillman's presentation provided a rough outline of the plans, although those plans are not finalized. The questions raised were expected. How do we stop botters if we have no tools? Is CCP changing the EULA to allow corp and alliance leaders receive information on who is botting? What are alliance leaders supposed to do if they find one of their members botting? Policing the EULA is CCP's job so why do alliances have to do it? Amongst all the people trying to argue that holding alliance members accountable for the actions of their members and/or renters, one man got up and asked if CCP had considered making botting legal. That attitude that botting and illicit RMT are acceptable activites is unfortunately reflected amongst some alliance leaders. At the CSM 7 Spring Summit, UAxDEATH pressed CCP about trying to track down alliances that rent null sec systems for real money. And some CEOs go to botting forums to recruit botters. I found two recent examples on the H-Bot forums. 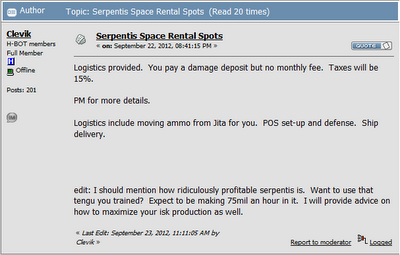 Notice that one of the selling points to botting recruits in both posts is the availability of a POS to operate from. Wonder why the video showed POS blowing up? Because bots need a place to hide when a neutral or red show up in the system. Without a POS, a null sec system is much less attractive. 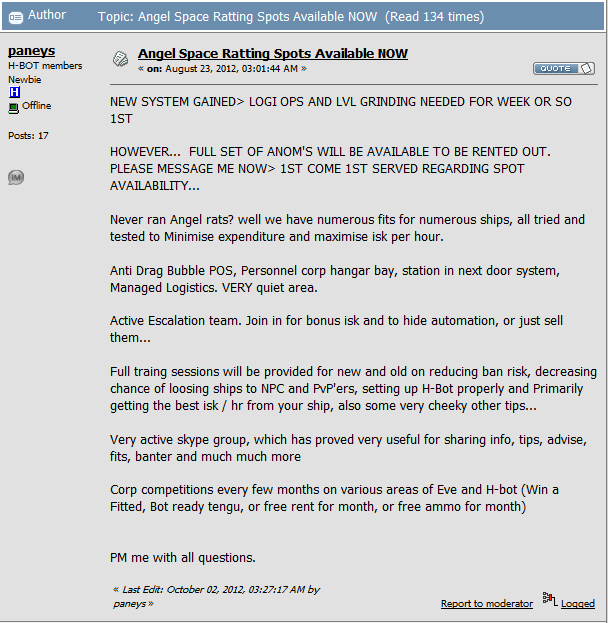 CCP Sreegs has angered many players for what they consider a lax policy toward botters. While many players wish to see a permanent ban upon a first offense for botting, the current penalties are 14 days for the first offense, 30 days for the second and a permanent ban for the third. Of course, other penalties include confiscation of isk and revoking the rights for a banned account to trade characters. But CCP Sreegs only implemented those penalties after his initial plan did not have the desired effect. I don't believe that CCP Sreegs wants to bring the hammer down on any alliance that wants to follow the rules. 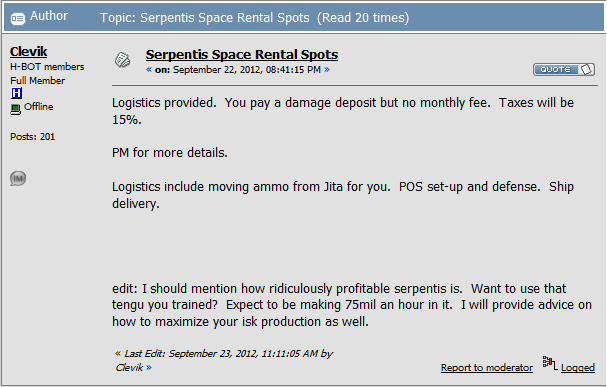 I can see the reasons for CCP Sreegs trying a cooperative approach working with alliance leaders first. The job of Team Security is to enforce the EULA without banning or causing half the players to quit. Or, in the case of alliances, without causing sovereignty to change for significant portions of null sec. But something tells me an alliance is going to test CCP to see just how serious the company is in fighting botting and illicit RMT. With Eve Vegas beginning today I decided to do a little surfing around the Eve botting forums. I didn't really find enough to warrant a full "War on Bots" post, but I did find some amusing posts from September. Before getting to the botting posts, I thought I'd bring to light an apparent scam occurring on the Public Demand forums. Im looking to sell my EVE account. Its a caldari female with 62,000,000 sp. 7mil in drone skills, 6 mil in electronics, 3.5mil in engineering, 6.5mil in gunnery, 3.5 mil in indy, 2 mil in leadership, 3 mil in mechanic, very bad missile skills, 4.5 mil in nav, 6.5 mil in science and 17 mil in spaceship command. Minmi, caldari and gallente frig and cruiser V, good projectile and hybrid skills. perfect shield and armor skills. recons V. Thanny pilot(comes with thanny). Perfect jamming skills. Can also fly black ops and build cap ships. Owns many ships and assets including vigilant, cynabal, thanny, dedspace fitted ishtar, arazu, lachesis, falconjust to name a few of the ships off the top of my head. Been pretty busy since finishing uni so dont have time to play anymore. Comes with just under 1 month subscription and 1bil isk. I know off the top of my head that the current ship hangar is estimated at 3.5bil aswell. Character and assets mentioned above are all in highsec/1 jump from highsec. If you have any questions then let me know and i will be happy to answer them. 2 weeks later he changed the account PW, and gave me false info. I lost 275 American dollars, so I am getting character banned unless he contacts me so if you were going to buy character I wouldnt as it seems to be a scam. Ever wonder why the Eve Online forums have a Character Baazar section? The above is why. Now for botting related matters. Forgive me for including a post from August, but I liked it. 31 August: frblyes (H-Bot) - so are the bans still being given out like free candy from a pedafile to little school girls? 15 September: godles1 (Eve Pilot) - just got back playing eve started miner up did about 6 hours of ice minning. down time came went to eat came back to play and said was ban for macro.i was on my other guy doing mission so how is i use your program now and get baned now? 18 September: Captain Obvious (Eve Pilot) - I agree with "the Eldest". Usually it takes another botter that reports a botter, yes sad but true. I've been doing the "bot while near my computer" just to see what kind of things go on. I get called out in local in which I respond to but still get reports. I've had two accounts slapped with the 1 week sanction but that was a while ago. I generally don't bot now without myself being around, why? one players in EvE tend to be asses, two once you know how a bot works its not hard to spot others using some version of botting software. Three people report because you are their competition. Everyone says this and i believe its true... if you stay in the same system too long you WILL eventually get busted and reported. Note: Notice his character name is the same as his botting forum name. 30 September: ashleydeals (Eve Pilot) - Had a late night and I accidentally left the courier on for too long I guess. Banned 14 days today. Warning to all. Why The Hate For Asteroid Belts? Sometimes I click on links that lead to threads in the Eve Online forums and my opinion about those forums is confirmed. But when I read the ones about low security space, I keep reading the idea that removing asteroid belts would make the area more popular. Really? I guess the idea is that mining in gravimetric sites is safer than mining in asteroid belts and so putting all ore in gravimetric sites will make mining in low sec safer. I don't like that idea. Asteroid belts and the ores they contain give a system some character and identity. I personally want to live in .1 and .2 security systems because they contain better quality ores. Without that difference, what makes a .1 system different from a .3 system? The thought that really boggles my mind is having to scan down a signature to mine some veldspar. How is that a good idea? Currently low sec is like grocery shopping. If I want something nice at a cheap price, then I have to shop around. But if I run out of ice cream in the middle of the night, I can just walk over to the corner 7-11 and pick up a pint. The same principle applies to low sec. Currently if I need a small amount of low-end minerals I just hop in my Procurer and mine for 15 minutes. If I want the nicer ore like crokite and spodumain and don't want to travel to null sec and deal with bubbles, then I need to scan down sites. Of course, I'm not a big miner. For those people who require hours and hours of uninterrupted mining, they can make more in high sec or null sec. But taking away the asteroid belts in an attempt to lure miners to low sec? Is this just madness or am I missing something? I am confirming something I think I already knew; I can't play multiple MMOs. I'm trying to play Guild Wars 2 and on Saturday I just couldn't remember the path I set in-game. The fact that I'm only playing one day a week doesn't help. Usually when I play a game I play every day. I thought I had broken the cycle of depending on playing a game every day with Eve Online. Over the course of the past two years I've taken business trips where I have not even logged into the game for 2 or 3 weeks. When I got back I just picked up where I left off. Is Eve special in some way? I guess the advent of the skills queue and EveMon helps. With EveMon I set up a training plan for a year at a time. In other games skills advancement is based on actually playing the game, which in the case of GW2 has meant a lot of grinding. Grinding breaks the flow of the quest trail (another feature missing in Eve) and then I forget where I am when I log back in a week later. Another feature is the crafting system. In Eve, everything ship and ship mod (excluding rigs) needs tritanium, the first mineral a new player in Eve can extract. Other games make players collect different base metals depending on the tier of content. Guild Wars 2 is even more complicated with its discovery system. Don't get me wrong, I like it better than the crafting in other games. The system actually reminds me of the tech 2 production chain, except less complicated. But I keep forgetting what I want to accomplish. I think the big difference is in Eve I don't have to worry about doing things to advance my characters abilities in-game. That leaves me free to pursue things I want to do, like bookmark low security systems or scan down signatures, without feeling I'm somehow falling behind. With every other game I almost have to log in every day just to keep the momentum up to advance my character. Trying to only play once a week feels strange. The only game I've really succeeded in doing that is Eve. With no subscription fee, I can go back to Guild Wars 2 anytime I like. I do want to continue the experiment to see if I can play a game for one 2-3 hour play session a week. Maybe I can figure out how to yet. The rankings of the top twelve MMORPGs as determined by the players of the Xfire community from play on Sunday, 30 September 2012. For more details about the methodology, click here. Historical data can be found here. Pandamonium broke out Sunday as the Xfire community spent 18% more hours playing MMORPGs than the week before. The increase was led, unsurprisingly, by World of Warcraft whose Mists of Pandaria expansion led to a 100.2% increase in the number of hours spent playing the game over the previous Sunday. While percentage-wise Vindictus saw the biggest decrease in play (-22.6%), the big loser was Guild Wars 2 as the Xfire community spent 20.8% time less playing the game compared to the week before. Tobold Wins! Apparently The Digital Dozen has attracted the attention of Tobold and his readers who are basing a bet on which game would be more popular, World of Warcraft or Guild Wars 2, on the listings here. For the Sunday following the launch of the game, that was a sucker bet. I'm beginning to wonder how much time Tobold spent in Jita when he played Eve Online. A more interesting bet would be to compare the games on 4 November. I still think that WoW will still have more hours played but I'm not sure of that conclusion. A Genre Bucks The Trend. This week as many games lost players to WoW's new expansion, the science-fiction games all saw increases in playtime. Star Trek Online led in percentage terms (+9.7%) while Eve Online led in actual hours gained (233). Even Star Wars: The Old Republic saw a gain of 2.2%. I guess that shows that the EA/Bioware game has shed most of the players it is going to lose. Either that or players of sci-fi games hate pandas. Mabinogi's First Appearance. The Korean-import Mabinogi makes its first appearance in The Digital Dozen this week. I first heard of the Nexon game from Massively.com's Beau Hindman back when he was podcasting. The game sounds interesting, with no class system and a death penalty that includes the loss of experience and possibly gear in PvE. Throw in the fact that the world is loosely based on Irish mythology and if I didn't have enough games to play I might give the game a try. "We believe in making virtual worlds, and they don't have a shelf life. We want this game to be around in 10, 20, 30 years." One of the distinguishing features of Eve Online is the physical mark the players make in the game world. While game play features like POS and starbases dot the universe, New Eden contains objects that commemorate events that step partway out of the limiting constraints of the browser. CCP has created monuments for events like alliance tournament victories and the riots that occurred in Jita that were the in-game manifestation of player discontent during the Summer of Rage. Has the time come for a new type of memorial? For noted artist and blogger Rixx Javix, the answer is yes. Fresh off his successful campaign to return the trademark frill to the Vagabond, Rixx is now focused on establishing an in-game memorial for those players who die in real life. Inspired by the tragic death of Sean "Vile Rat" Smith in the terrorist attack on the U.S. consulate in Benghazi Rixx came up with a proposal that would not only honor those who have already died but those who will die in the future. "What I'm driving at here is nothing short of a permanent massive memorial to the fallen in-game. Something that fits within the context of Eve, the universe, lore, and conventional mechanics. If Capsuleers are the Gods of New Eden, then I think they deserve a God-like Memorial of significance. We humans, and I suspect Capsuleers as well, have historically erected large scale memorial systems to honor those that have passed away before us. I suspect that the future will not be all that different. Especially when it is an immortal Capsuleer that has passed into the great mystery. "To my mind, nothing symbolizes the "great mystery" in New Eden more than the Eve Gate. It is where our ancestors came from and beyond which is nothing more than the great unknown. "What I am suggesting is the creation of the opposite. A Great Ring of Fire on the opposite end of the universe from the Eve Gate. A dark hole that symbolizes the place where we go after death. The great beyond. "A place where the mechanic exists to immortalize those Capsuleers of distinction that have left us forever. Not those that un-sub never to return, but those that have tied their lives in a significant way to our universe and that we know have left real life as well. A hall of heroes if you will, a Hall of Fame, a grand memorial to the fallen." Given CCP's stated goal of the game running for decades, another tragic death to a player is inevitable. As I thought about the situation, I remembered the current activity by the Council of Stellar Management. As the CSM worries about the procedures to handle an event in which a CSM member cannot take office after an election I asked myself, "should the CSM and CCP prepare for the eventuality of a player who can no longer log into the game because of a real life death?" While nothing can bring a player back from beyond the grave, such a memorial could help ease the pain of those left behind who play the game. In support of his effort Rixx has created a forum thread on the official forums and has begun producing artwork and videos. His latest video was a collaboration with Aiden Mourn that debuted yesterday on YouTube. If we don't see a ring of fire, we should see something similar. The game really could use some sort of memorial.